In conjunction with the ongoing Yoko Ono: One Woman Show, 1960-1971 exhibition at the Museum of Modern Art, visitors are invited to participate in one of the historically maligned artist’s performance works. Morning Piece was first performed in Tokyo in 1964 and then again in 1965, on the roof of Ono’s apartment at 87 Christopher Street. As her guests gathered for the sunrise, Ono sold shards of typewritten pieces of paper attached to broken glass. Each piece named a future date and period of morning. By selling these objects at prices ranging from 10 yen to 1,000 yen, Ono commented on putting a price tag on the ethereal. The MoMA’s manifestation of the event will feature a performance by Blood Orange and a DJ set by FLAT WHITE (Virgil Abloh). 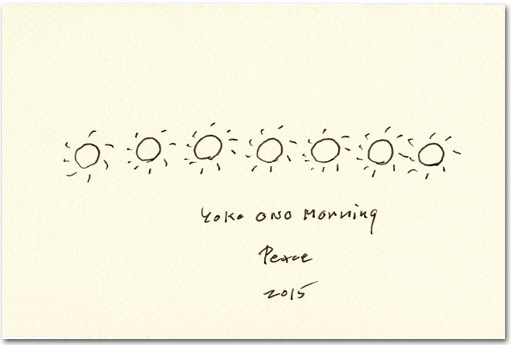 YOKO ONO MORNING PIECE 2015 will occur from 4:30-8 am on Sunday, June 21. Visit the MoMA’s website for more information about the event.